> How was Aboriginal land ownership lost to invaders? Aboriginal people owned all of Australia prior to invasion. Why can courts today successfully turn down their land claims? In the Eurocentric view of the world, it was the so-called 'Age of Discovery' when European nations sent out their explorers during the 15th to 17th centuries. Their governments were greatly influenced by Catholic doctrine and papal power. One doctrine was that Christians had the right to claim lands, territories and resources of Aboriginal people all over the world because they were not Christians. On 4 May 1493, Pope Alexander VI issued a Papal Bull, “Inter Caetera”, which became known as the Doctrine of Discovery. It was central to the Spanish conquest of what the conquering nations called the 'New World', supporting Spain’s strategy to ensure its exclusive right to the lands 'discovered' by Christopher Columbus. The Bull stated that any land “not hitherto discovered” by Christians was available to be claimed and exploited by Christian rulers and declared that “the Catholic faith and the Christian religion be exalted and be everywhere increased and spread, that the health of souls be cared for and that barbarous nations be overthrown and brought to the faith itself”  (my emphasis). It basically meant that the "barbarous nations" could be enslaved or murdered if they refused to convert to Christianity. It also meant that Aboriginal peoples' long-standing rights to land could be wiped out. The Doctrine of Discovery is a key premise for post-invasion government claims to legitimacy on and sovereignty over Aboriginal lands and territories. It was used not only by Spain, but also by former British colonies like Canada, Australia, New Zealand and the United States of America  to seize Aboriginal land. In the USA, where the Doctrine has been enshrined in law, it was used as the foundation for the western expansion  and to justify efforts to eliminate Aboriginal languages, practices and world views, and it affects Native American sovereignty and treaty obligations . Courts have based judgements on it as recently as 2005. As a result of the Doctrine the delusion that white people and Christians had certain 'divine rights' was deeply ingrained in the policies of many colonial and post-colonial societies . Pope Alexander VI's bull built on two earlier bulls with a similar world view. In 1095, at the beginning of the explorations, Pope Urban II issued the Papal Bull Terra Nullius ("empty land"). Terra Nullius is a concept Australians are very familiar with. The bull also gave the kings and princes of Europe the right to "discover" or claim land in non-Christian areas. 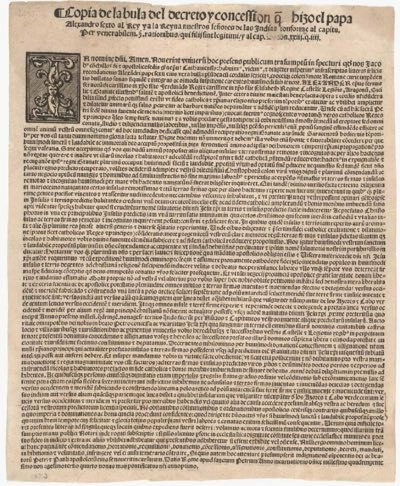 This policy was extended in 1452 when Pope Nicholas V issued the bull Romanus Pontifex, declaring war against all non-Christians throughout the world and authorising the conquest of their territories. These papal bulls treated non-Christians as uncivilised and subhuman and therefore without rights to any land or nation. Christian leaders claimed a god-given right to take control of all lands and used this idea to justify war, colonisation and even slavery . Watch Elders of the Iroquois give testimony and tell their story about how the Doctrine of Discovery set the foundations to destroy their nations. Is the Doctrine of Discovery still valid? In the US, Native American groups have tried to overturn the doctrine since at least 1984  and numerous US faith communities have also called for repudiation. The Vatican has said that later bulls and papal apologies show the church no longer supports the doctrine  but has so far not repudiated it. The Doctrine of Discovery is still used to diminish validity and significance of international treaties between Aboriginal peoples and the USA, Canada, New Zealand and Australia . Forced removals. For example, the Trail of Tears in the USA and the Stolen Generations in Australia (where state authorities seize more Aboriginal children than ever). Resources grab. Natural resources were seized for the benefit of non-Aboriginal people only to mine the land or breed livestock. Premiers in Australia have simply seized Aboriginal lands when their patience to negotiate ran out. Destruction of culture. Traditional culture and language was forbidden and subsequently destroyed. In Australia bilingual education was forbidden as recently as in the 2010s. Forced sterilisation. Native American women were forcibly sterilised and Australian Aboriginal women presumably as well . A recent example would be attempts by the Western and South Australian governments to shut down and bulldoze Aboriginal communities deemed "unsustainable" because supplying services was "too expensive". Lost sovereignty. The Doctrine’s assumption about who is sovereign underpins the imposition of policies on Aboriginal peoples that they reject. Loss of human rights. Aboriginal peoples' human rights are less protected. For example, there is no Aboriginal jurisdiction over crimes committed on their lands by non-Aboriginal people. No recognition as a nation. Under the Doctrine Aboriginal peoples have a diminished and impermanent status which is contrary to the right of Aboriginal peoples to sustain themselves in perpetuity as distinct peoples, a right affirmed in the UN Declaration on the Rights of Indigenous Peoples. No treaties. The Doctrine considers Aboriginal people as only "occupying" but not owning the land. This is a barrier to negotiating treaties which, in the USA are the highest law of the land, equal to the constitution and made between sovereign states. No self-determination. Self-determination of Aboriginal peoples brings them into conflict with governments and corporations that rely on the legal lineage of the Doctrine to assert claims to natural resources, such as coal, oil, uranium, other minerals, natural gas and water. Since 2007 the US-based Doctrine of Discovery Study Group has been reading, discussing and educating themselves about Aboriginal Peoples' history, world views and struggles. They aim to influence the Pope to rescind the Papal Bulls.